Magnetic curtain rods are a quick and easy way to install curtains on metal doors and windows without needing to drill holes for screws. A magnetic curtain rod is by far the most convenient curtain rod ever designed. It practically installs itself. You simply press it against the door and the magnets grab onto the steel. You don't need any tools or hardware to install these rods. They remove just as easily and there are no holes left to patch up. However, there are obvious disadvantages to this type of curtain rod. There is no way to install a magnetic rod onto wood or drywall unless you use a strong adhesive to adhere it to the door or wall. While it is possible that this might work, it is almost certain that removing the curtain rod will damage the door's or wall's surface. The adhesive might also not be strong enough to hold the curtains if they are made from a heavy material. Magnetic rods work best with light or sheer curtains. However, if you want to hang a curtain made from a heavier type of material, there are rods that come with more powerful magnets. The magnets that hold the curtain rods in place will only work on ferrous metals (metal containing iron). The rods will not work on aluminum doors or window frames. You can also use a magnetic rod on the refrigerator to hang extra kitchen towels. While styles and colors of magnetic rods are very limited compared to traditional curtain rods, there are still a few options to choose from. MagneRod Café Rod is adjustable from 17" to 30". Super MagneRod II Café Rod has stronger magnets and can hold up to 15 lbs. It adjusts from 17" to 31". MagneRod Sash Rod is designed for sash style curtains that cover the long vertical windows on either side of steel entry doors. There are two in each package and they adjust from 8" to 15". MagneRod Wide Pocket Rod has a 2" deep wide pocket and is designed for wide pocket curtains such as window toppers and valences. This rod is only available in ivory. The other three are available in ivory, white and brass. The second type is called Miracle Rod. Miracle Rod is magnetic and also comes with adhesive so you can use it on all other types of smooth surfaces. 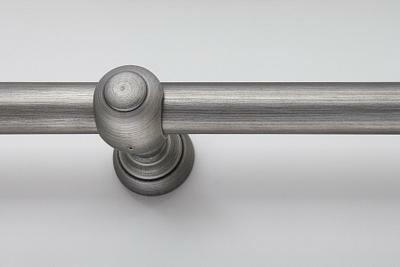 This rod is designed to be used with sheer or lace curtains. Miracle Rod comes in one color, clear. If you have a door or window that a magnetic café rod would work great on but you really want one in a different color, you could easily customize your rod with a can of spray paint in the appropriate color and about five minutes of your time. Just make sure the rod is thoroughly dry before you attempt to put a curtain on it. Some department stores such as Kmart and Target also carry these curtain rods. Prices vary according to the size and style you need. Magnetic rods are under $30 and many are under or around $20.